The Seacoast region of New Hampshire is served by New Hampshire’s Pease International Tradeport, Manchester International Airport, Logan Airport in Boston, and Portland International Airport in Portland, Maine. Browse the links below for discount airfare, and flights. To feature your NH business, contact us. 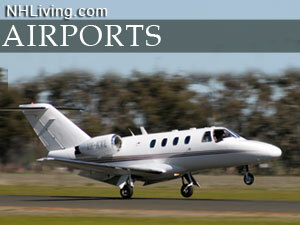 This seacoast airfield is available for charter and private flights only. The airfield features a runway side restaurant that’s popular with local airbuffs. The turf runway is 2,100 feet long. The former Pease Airforce Base now provides commercial air service. The airport offers plenty of free parking, and easy access from I-95 and the Spaulding Turnpike. Convenient to Boston, Portsmouth, UNH, Portland & Manchester. Formerly known as the Portsmouth Air Force Base, the Air Force dedicated and renamed the base in honor of Captain Harl Pease, Jr., a native of Plymouth, New Hampshire. Captain Pease had posthumously earned the Congressional Medal of Honor for his extraordinary heroism as a B-17 pilot during a bombing raid against the Japanese in Rabaul, New Britain, in August of 1942.